This pathfinder aims to assist researchers in locating materials on the legislative process in California. Researchers will learn how to find and track proposed legislation and how to engage in effective advocacy. Finding current California legislation is generally straightforward, thanks to a number of helpful print and electronic sources. Bills can easily be located by bill number, by subject, by the name of the legislator who introduced the bill, and even by reference to existing sections of the California Constitution, codes and uncodified laws affected by measures introduced. Several examples of how to search for legislation in these various ways are provided as follows. The bills from each house are numbered sequentially as they are introduced during the legislative session. The prefix "AB" is assigned to Assembly bill numbers, and the prefix "SB" is assigned to Senate bill numbers. Other common designations for legislation include ACA or SCA for constitutional amendments and AJR or SJR for joint resolutions. a. Official California Legislation Information Inquiry System (http://leginfo.legislature.ca.gov/). Searching by bill number or author in the Official California Legislation Information Inquiry System ("Leginfo website") is as simple as entering the desired number or name into the search box that appears on the "Bill Information" page of the site. To narrow a search to a specific house, researchers may use the drop-down lists that appear at the top of the page. b. WestlawNext. WestlawNext's California Bill Tracking--Full Text database (CA-BILLTEXT) contains full text of current California legislation. The database is updated daily. Searches for legislation by bill number or author are best performed via use of the database's simple search template. c. Lexis Advance. Lexis Advance's Full-Text Bills database (Statutes and Legislation > CA Full-Text Bills) contains full text of current California legislation. The database is updated within one day of publication. Searches for legislation by bill number or author are best performed via use of the database's document segments. a. Official California Legislation Information Inquiry System (http://leginfo.legislature.ca.gov/). Searching for legislation by subject or sections affected on the Leginfo website is equally straightforward, thanks to a basic keyword search box provided on the "Bill Information" page of the site. Although exact phrase searching is possible with use of double quotation marks, the system does not recognize Boolean search logic. To narrow a search to a specific house, researchers may use the drop-down lists that appear at the top of the page. Before clicking "Search" to run a query, be certain to toggle the "Keyword" button that appears above the search box. b. WestlawNext. WestlawNext's California Bill Tracking--Full Text database (CA-BILLTEXT) contains full text of current California legislation. The database is updated daily. Searches for legislation by subject or sections affected are best performed via use of terms and connectors to construct an effective search statement. c. Lexis Advance. Lexis Advance's Full-Text Bills database (Statutes and Legislation > CA Full-Text Bills) contains full text of current California legislation. The database is updated within one day of publication. Searches for legislation by subject or sections affected are best performed via use of terms and connectors to construct an effective search statement. d. Legislative Index. The Legislative Index is published electronically and in print by the Legislative Counsel. The Index provides a subject matter index of all legislative measures for the current legislative session, and indicates the subject of each bill, constitutional amendment, and concurrent or joint resolution as introduced and as amended. The Index is available electronically in searchable HTML and PDF formats. The Index is also held in the collection of the UCLA Law Library, together with the Table of Affected sections, at KFC14 .L43i. Last updated in January 2009 by the Legislative Counsel, this guide provides a brief overview of sources of bill information and California law on the Internet, as well as a summary of the legislative process. A helpful glossary of legislative terms is provided in Appendix B of the guide. The Legislative Index provides a subject matter index of all legislative measures for the current legislative session. The Index indicates the subject of each bill, constitutional amendment, and concurrent or joint resolution as introduced and as amended. Entries are not removed from the index when the subject matter is deleted from the measure in the course of passage. The Index is available electronically via the link provided here and in print (Call No. KFC14 .L43i). The Table provides an index of each section of the California Constitution, codes and uncodified laws affected by measures introduced. The PDF and HTML documents referenced here include links for the measure and chapter number. Though the table is updated regularly, it may not include all legislative actions as of the date indicated on the title page of the document. The Table is cumulative and is published by the Legislative Counsel. The Table is available in print as well (KFC14 .L43i). Enter the required information and click “Submit.” Once you do so, it will process your registration and then redirect you to the login page for the Leginfo website. You will need to check the email account used in your registration for an email from the website, which will provide a temporary password to validate your account. You can copy (Ctrl+C) and paste (Ctrl+V) that password to login into the Leginfo login page and then click “Login,” which then will prompt you to create a new password. Once you do this, you will be logged into the Leginfo site. Once you click "Add Notifications," you are done! If you ever wish to delete a subscription, you simply revisit the My Subscriptions link and click the option for "delete." The status and history of a bill may also be determined on the Leginfo website by clicking on the "Status" and "History" links that appear at the top of every Bill Document. The "Status" of a bill reflects the last historical action date of a bill and any scheduled hearings. The "History" of a bill reflects all legislative activity associated with a bill, including its introduction, dates of amendment, and voting record. Enter Search Terms: You can add keywords or bill number information using the initial search box, though it is recommended that you take advantage of the advanced search feature (link is found next to the orange search button in WestlawNext. 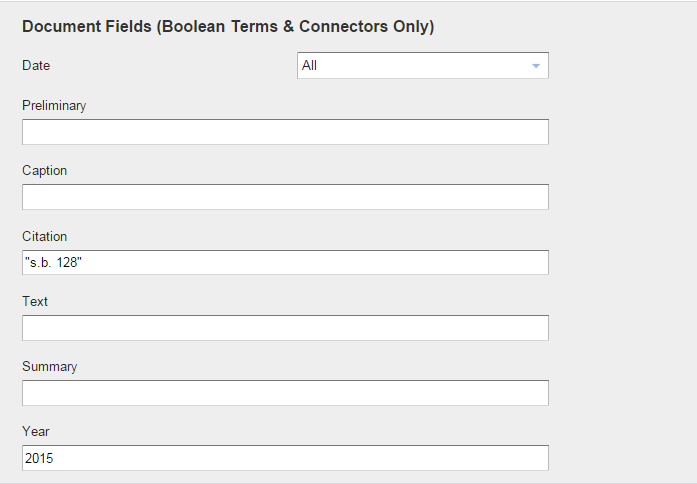 If you elect to create a WestClip by reference to a specific bill number introduced in a specific year, the search would look as follows, using applicable terms and connectors: advanced: CI("s.b. 128") & YE(2015) (this searches for Senate Bill 128 introduced in 2015). You can preview your results by clicking Enter or the orange Search button near the top of the screen. Customize Delivery: When you retrieve the desired bill, click on the box next to the desired bill to select the item and then click on the bell icon and then the link for Create WestClip Alert to create your alert. Schedule Alert: Once you have completed the aforementioned steps, the final step is to designate the frequency of which alerts will be sent, the end date for receipt of alerts (if desired), and the time at which alerts should be transmitted. Select the blue Save Alert button to save and schedule your alert, and then you are done! 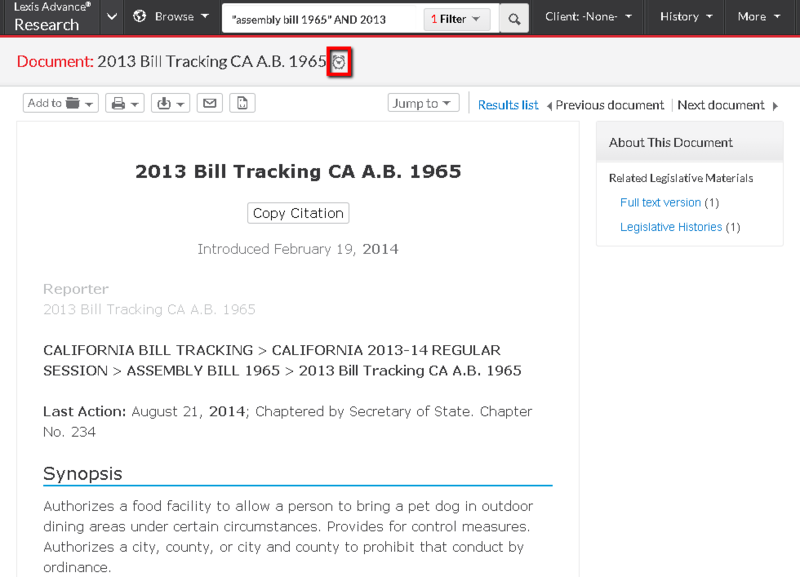 Lexis Advance has a legislative tracking feature that is similar to WestlawNext's. To get to the relevant database, from the top of the home page select Browse. 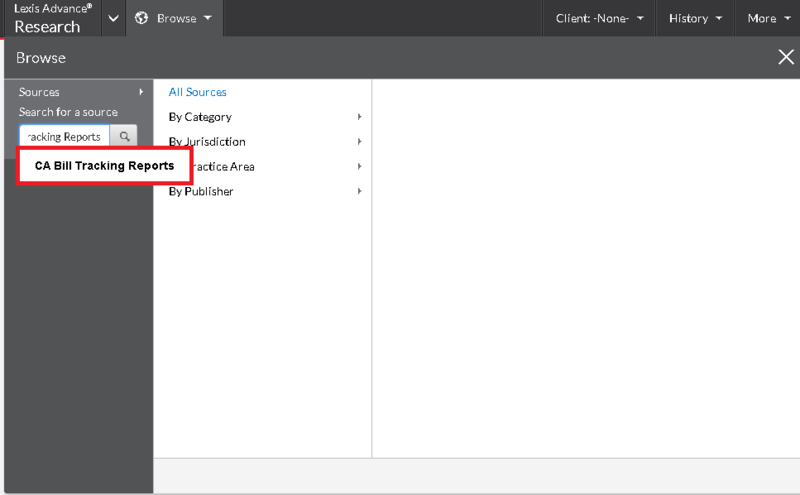 Then, in the Search for a source box, type CA Bill Tracking Reports, hit enter, and select Add source as a search filter to select the database for searching. The Lexis Advance CA Bill Tracking Reports database contains summaries and status information of current California legislation. The database is updated within two days of publication and legislation is tracked from introduction to the end of the biennial session (or to the date the bill dies, if sooner). Searches may be performed using natural language or terms and connectors. Subscribers to Lexis can use the system's Alert feature to subscribe to alerts for proposed legislation. When viewing a bill that you woudl like to track, click on the alarm clock icon to begin the process of creating an alert. Then proceed to specifiy your delivery options. The Daily File presents the daily agenda of the Assembly. The Assembly Daily Journal is the official record of business that has been transacted in the Assembly on a daily basis. The Journal shows all roll call votes, notes parliamentary motions, lists bill introductions, and records any other official actions taken by the Assembly. This link provides access to both the current and historical Daily Journals of the Assembly. Provides links to several helpful resources published by the Chief Clerk of the Assembly. Provides links via which researchers can listen to live hearings, floor sessions, and press conferences over the Internet. Requires speakers, a sound card, and Windows Media Player. The Assembly and the Senate publish a Daily File that contains the Officers of the respective houses, the Order of Business, the tentative schedule for the entire legislative session, and a listing of the bills that are scheduled to be heard on the floor and during committee hearings. Daily Files for Assembly and Senate Extraordinary Sessions are published as well. Like its counterpart for the Assembly, the Senate Daily Journal documents the official proceedings of the Senate. The contents include the title of each measure considered, vote results, messages from the Governor and Assembly, reports from Senate committees and other agencies as required by law, and the contents of petitions, memorials, or other papers presented to and authorized by the Senate. This link provides access to both current and historical Daily Journals of the Senate. Offers streaming video of live and archived webcasts of legislative broadcasts. Requires speakers and a sound card. This site is maintained by the Legislative Council of California and provides access to bill information for pending legislation, the current California Code, and various legislative publications. Provides archived PDFs for California State Assembly Journals (1849-2009), Histories and Indexes (1881-2009), and Statutes (1850-2008). Developed by Sunglight Foundation, Open States is a comprehensive database for researching legislative data for all states in the United States. The database is free to access and use, and enables you to search for state lawmakers, review voting records, search and track legislation, and review supporting documents. "Digital Democracy is a product of the Institute for Advanced Technology and Public Policy. The new online platform features a searchable database of California state legislative committees hearings, allowing the user to search videos by keyword, topic, speaker or date. Digital Democracy is a first of its kind tool because it will transcribe all legislative hearing videos and will make the transcriptions available to users in their searchable entirety. These data rich transcripts represent an entirely new data set that is currently unavailable to the public."